Jesus is the true Light. There is no other Light other than Him. He does not get His Light from another source, rather He is the source. The True Light is underived, self-fed and undying. There are other lights that are not true. Satan masquerades as an angel of light. He is a master deceiver. He is not the true light however much he wants people to think that he is. He even wanted to be God and so it is no wonder that that is still what he wants. He will light you path with illusions make you believe that this is what you need in your life to make it complete. Do not fall into the snare of satan. Satan’s desire and aim is to destroy you and take you with him to eternal damnation. He does not want to go there alone; he wants to drag the whole of the human race with him. He sheds his false light and illuminates the dark ways and makes it attractive and sparkly – the Bible calls this the wide gate, or the broad way which leads to destruction- another way that this is also described in the Bible is ” a way that seemeth right unto man, but the end thereof are the ways of death”. Do not be deceived. If you follow this false angel who masquerades as light, there is only darkness, destruction and death at the end. But praise be to God for His Word. Jesus is the True Light. In Him is Life and life in abundance. And how, you may ask, does one receive this Light and Life. As there is only one true Light, so there is only one Way to receive this gift. Jesus says “he that believeth on me shall not walk in darkness but shall have the light of life”. 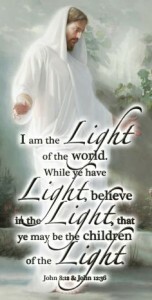 Simply believe that Jesus is the Lord God and Savior of the world and you will be saved and walk in everlasting Light.